In an effort to portray a welcoming environment for students of color, some Christian colleges and universities may be tempted to overrepresent their racial diversity in their promotional materials. 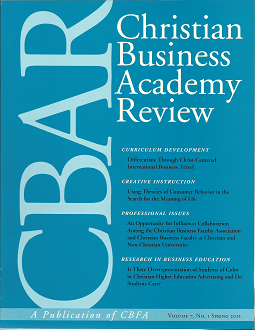 Through a two-phase empirical analysis, this study explored three factors that are central to this potential ethical issue: the prevalence of racial overrepresentation at Christian colleges, the relative attraction of promotional materials that depict higher versus lower percentages of students of color, and prospective college students’ evaluation of racial overrepresentation. Although relatively few Christian schools were found to overrepresent their student population’s actual racial diversity, some did so substantially, and others even underrepresented their diversity. Furthermore, while prospective college students expressed only moderate concern about racial overrepresentation, their attraction to various brochures differed along racial lines. Students of color exhibited little variation in their preferences, but Caucasian students tended to favor brochures that depicted medium to low levels of racial diversity. These findings present unique ethical considerations for institutions of Christian higher education, which often emphasize integrity, reconciliation, and concern for those who are disadvantaged.